New Turf Installed At Hummer Sports Park, Topeka, KS. ! TOPEKA, Kan. (WIBW) — The soccer field and football field at Hummer Sports Park have new turf. Both fields replaced the old turf that maintenance supervisor Aaron Becker says was more than a decade old. Becker says the entire project costs nearly $800,000. The fields will be ready for play in late July. Both fields are still without the sand and rubber that cushions the turf. On the football field, the crew was finishing up the end zones with the Hummer Sports Park logo. Becker says the field will eventually have a midfield logo. 5 Ballfield Maintenance Tips for A Midseason Shape Up ! The ultimate ballfield resource. It’s all here. Managing Sport Facilities – 3rd Edition ! Managing Sport Facilities, Third Edition, provides students with the vital information and vocabulary to make smart decisions in all areas of facility management. This edition includes a new chapter on green facility management as well as an instructor ancillary package featuring new video content. County negotiating with Jordan Foster to complete El Paso Sportspark ! County negotiating with Jordan Foster to complete Sportspark. The county is negotiating with Jordan Foster Construction, the company that built the Downtown ballpark, to finish the long overdue El Paso County Sportspark renovation. County officials expect Jordan Foster to resume work at the Sportspark more than a year after legal issues with the former contractor and architect put the reconstruction on hold. The project, which was supposed to take eight months to complete, started in October 2012. A contract is expected to go before the County Commissioners Court for approval in the next 30 days, said Norma Palacios, the county’s assistant public works director. It would then take Jordan Foster about three months to complete the work, Palacios said. The county selected Jordan Foster through a process called job-order contracting, in which qualified companies are on a sort of on-call list for certain types of projects. The process is faster than a traditional bidding process, county officials said, because it cuts the time it takes to procure engineering, design and contracting companies. As part of the process, Jordan Foster was one of four companies interviewed by a panel of five people. A contract amount is expected to be determined in the next couple of weeks, Palacios said. “Because of the job-order contract process, we now can concurrently negotiate with the contracting firm and don’t have to wait until the architect finishes its job to put the work out to bid,” County Judge Veronica Escobar said. Earlier this year, the county hired Carl Daniel Architects for $187,500 to oversee the pending construction at the 45-acre Sportspark at 1780 N. Zaragoza. Escobar said the architect’s work is about 90 percent completed. County Commissioner Carlos Leon, who represents the East Side area where the Sportspark is located, said he is satisfied with the selection of Jordan Foster. “I’m very confident that a company such as Jordan Foster will start on the project and finish it. We will have a beautiful completed park in the very near future,” he said. Jordan Foster Construction is a partnership by C.F. “Paco” Jordan, Paul L. Foster and Darren Woody that merged CF Jordan Construction and Franklin Mountain JFC. Jordan Foster completed the Downtown ballpark in under a year. Leon said there is still much work that needs to be completed at the Sportspark, including four fields, a pro shop, a clubhouse and batting cages. Six fields are currently open to the public. The county is still in a legal dispute with Sunlight Enterprises, the company that was awarded the original $7.5 million Sportspark contract in 2012; the architectural firm Parkhill, Smith and Cooper Inc.; and the bonding company, RLI Corp.
Part of the litigation involves money that the county withheld from Sunlight Enterprises after the company did not complete the project on time. 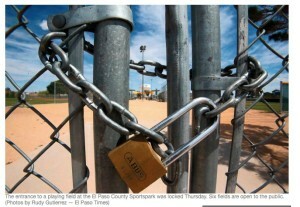 Leon said that while the legal problems are resolved, the county will move forward to complete the park. New Baseball complex gets good reviews, but coaches note one flaw ! 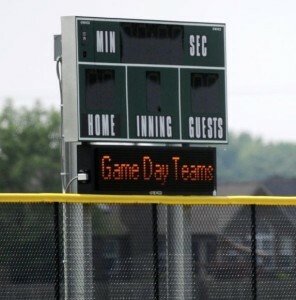 Scoreboards on the eight fields show the game’s score and inning, but they do not indicate other essential game data — namely balls, strikes and outs. The $16.5 million, built and managed by the Evansville Convention & Visitors Bureau, is being counted on to generate tourism for the area. It hosted its first tournament and opening ceremonies last weekend. The next one is booked June 20-21, and others are to follow during the summer. Coaches — while praising positives about the complex and the economic impact it will have — said they were surprised by the scoreboards’ omission of balls, strikes and outs. “I don’t know why you even buy a scoreboard without that,” said Mike Webb, coach of the Rookies 9U team consisting of boys from Boonville and Newburgh. Jeff Rothschild, who coaches the Evansville-based Southern Indiana Legends, a squad of 12-year-olds, said it is “awesome” that the area finally has its own baseball and softball complex, and the first tournament was undoubtedly a success. However, “I can’t imagine a baseball facility that doesn’t have balls strikes and outs on the scoreboard,” Rothschild said. Visitors Bureau Marketing Director Laura Libs said the scoreboard design was motivated in part by the message board, which will allow for the sale of advertising to generate revenue for the park. “That certainly was part of the discussion,” Libs said. In all, 47 baseball teams were signed up for last weekend’s tournament at Deaconess Sports Park. The complex was not entirely finished, and there were a few glitches. Scoreboards malfunctioned in two instances. Concession stands ran low on food, “which was a good and a bad thing,” Libs said. Coaches said the last-minute push to prepare fields for games was evident — sod was not packed solidly — but they praised efforts of the grounds crew, whose task was made even more challenging by occasional rain during the tournament. Rothschild, the owner of Evansville Garage Doors, said the arrival of Deaconess Sports Park will mean good things for the region and the local baseball and softball community. Rothschild saw visiting teams in local restaurants and in Eastland Mall during the weekend. “The most important thing I can tell you from a business standpoint is that dollars stayed in the community,” he said. But Rothschild said Deaconess Sports Park, while “beautiful,” needs to consider upgrading some fields for baseball teams in older age groups, while also tweaking the scoreboards. The complex’s eight fields can only accommodate 70-foot baselines, which are used for baseball for players as old as 12. Visitors bureau officials have said they did not intend for the facility to be used by older boys, who need at least 80-foot baselines, and they will consider paying for expanded infields. The cost is about $30,000 per field. Tournament organizers were caught off guard when they learned Deaconess Sports Park could not accommodate 13-year-old baseball. Last weekend, 13-year-old teams played at Bosse Field, a professional baseball park with 90-foot baselines. Game Day USA, the same sponsor of last weekend’s tournament at Deaconess Sports Park, will return for another tournament June 26-28. But for that event, games in the older age division will not be moved to Bosse Field or other Evansville sites. Those games have been canceled, and 13-year-old teams that had signed up were offered refunds or an opportunity to play in a Columbus, Indiana, event. An email to coaches from Game Day USA cited “logistical challenges” of having 13-year-old games at an alternate site, miles away from the primary location. Visitors bureau officials have said the complex was designed only for girls’ softball and for baseball up to age 12 because they considered those the strongest tourism markets. The complex in northeast Vanderburgh County is adjacent to Goebel Soccer Complex.